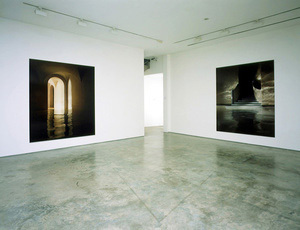 James Casebere’s pioneering work has established him at the forefront of artists working with constructed photography. 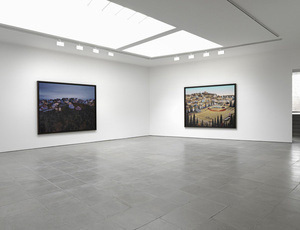 Over the past forty years Casebere has devised increasingly complex models and photographed them in his studio, creating photographic tableaux that subtly lay bare their own devices to inhabit the gap between abstraction and image, painting and photography. 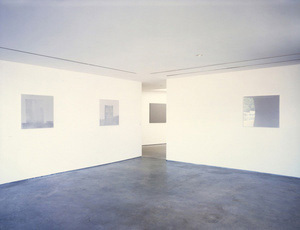 Casebere’s works have progressively depicted a wider perspective: the surrealist domestic scenes and claustrophobic vistas of his early pieces gave way to hauntingly evocative architectural interiors and exteriors of building typologies found both in the United States and the Middle East, while his Duchess County series (begun in 2009 and still ongoing) takes an aerial perspective of an entirely made-up, though acutely plausible community. 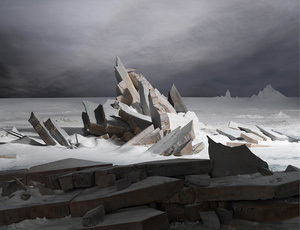 Creating simulacra that revise and usurp reality to expose what art historian Hal Foster considers “a psychopathology of everyday life”, Casebere’s scenes are profoundly ambiguous yet politically pointed, chronicling our times through images of unpeopled spaces and landscapes that convey a deep disquiet. Casebere was born in 1953 in Lansing, Michigan, USA and currently lives and works in New York, NY, USA. His work has been associated with the Pictures Generation of postmodern artists who emerged in the 1980s, which included Barbara Kruger, Robert Longo, Richard Prince, Cindy Sherman, Laurie Simmons, and featured in the Metropolitan Museum of Art’s 2009 landmark exhibition of that name. Major solo exhibitions have been staged at Haus der Kunst, Munich, Germany and BOZAR/Centre for Fine Arts in Brussels, Belgium. His work is also featured in museum collections worldwide, including the Whitney Museum of American Art, New York, NY, USA; Solomon R. Guggenheim Museum, New York, NY, USA; the Metropolitan Museum of Art in New York, NY, USA; Walker Art Center, Minneapolis, MN, USA; the Los Angeles Museum of Contemporary Art, CA, USA; the Los Angeles County Museum of Art, CA, USA; Victoria and Albert Museum, London UK; Tate Collection, London, UK, among many others.